This new high performance blade has set new Standards in efficiency and power deployment. The enormous performance of this blade has been demonstrated during several high profile international competitions including the 2014 Heli Masters World Championship won by Dunkan Bossion. Due to the high demand for scale blades, we decided to change the appearance to improve the scale optic. To do so, we paint them after taking them out of the mold, in different colors and they will receive yellow tips and a dull gray finish. If you see them, you will have a hard time to see the difference (except the size) to the fullsize helicopter. After undergoing all these paint jobs, the blades will be balanced and will receive final inspection prior shipment. As already announced, we are proud to introduce an evolution in blade design and this is our new Black Belt range of performance blades.Listening to the requirements and wishes of our customers, utilizing the combined expertise of our team pilots, the knowhow of the designer and the technicians in our production department we are certain that this new design and production method will set new boundaries and help pilots create ever more demanding and breathtaking performances. Weâ? ?ve also improved the blade production process. The bolt hole will no longer be drilled but is now constructed during the layering process in our factory. By doing this, the fibers will not be cut or destroyed resulting in a higher breaking strain without adding any additional raw material or weight. We have also chosen a new carbon fiber product that has improved the overall strength of the blade and for safety reasons we have reinforced the Kevlar taking into account the constantly increasing rpm requirements that pilots demand. In the design of our blades we have for several years believed in the benefit of Kevlar compared to wire, why? This is because Kevlar forms a compact bond to carbon however wire cannot bond successfully to epoxy and given our design criteria this is simply not good enough so why should we settle for less? Our pilots have paid special attention to the visual presence in the air and the new design maximizes the detection of flight attitudes enabling you to concentrate on your manoeuvre and less time focusing on airspace position. 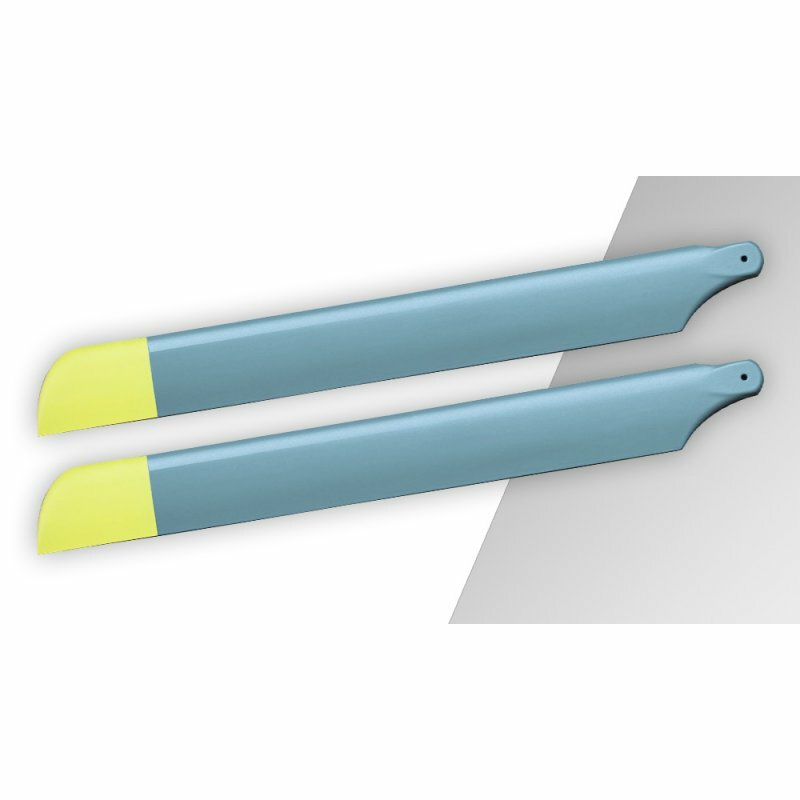 These Blades fit perfekt on a Gaui X7, Logo 600SE, Trex 700 or simular Helis in that Size.